First, the field will be split in the morning portion of the Saturday show. 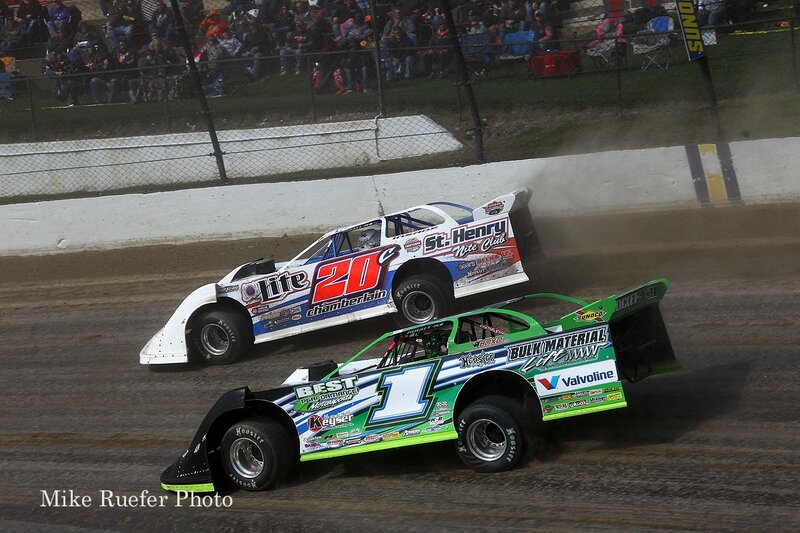 The field will battle for spots in two twin-25 lap main events paying $10,000 to win. Josh Richards was the quickest of 73 drivers in hot laps. He turned a 14.899. That’s beating on the door of the track record. 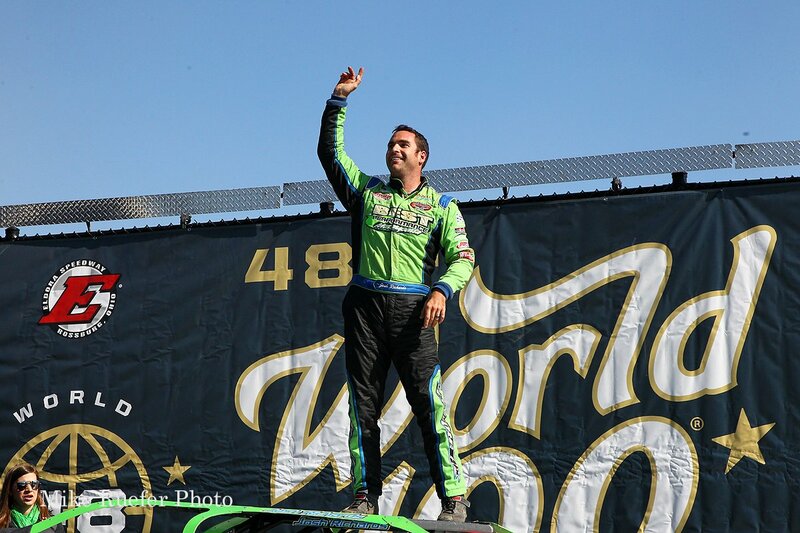 9 drivers into qualifying, Chris Ferguson has broken his own track record! He turned a 14.821. That’s an average speed of 121.452 mph. 33 drivers into the session, Brandon Sheppard jumps to the top. He takes the track record with a 14.761. Steven Roberts and Don O’Neal set the front row for the first heat race of the night. Green, Roberts leads on the bottom. O’Neal gets a run around the top. O’Neal gets to his right rear off turn two. Roberts holds him off. Sheppard is coming in a hurry on the bottom. He knocking on the bumper of the #5. They both work around Roberts. Two to go, Sheppard is looking low on O’Neal. He takes the spot. Sheppard wins the first heat race of the day! Gilpin and Zeigler lead them to the flag stand in heat two. Green, Gilpin leads off turn two. Turn three, Bronson throws a slider on Zeigler for 2nd. Two to go, Zeigler slides Bronson back in turn one. Bronson tags the wall off turn two. Devin Gilpin holds on to take the win in heat two! Duane Chamberlain and Jason Jameson set row one in heat three. Green,Chamberlain is clear by three car lengths into turn one. Richards looks to make it three wide in the middle for 2nd. Back in turn 1, Richards slides Jameson for 2nd. Jameson crosses him but Richards holds the position. Lap 5, Chamberlain runs the top, Richards on the bottom.Chamberlain has traffic in his lane on the top off turn four. He works around him and holds the lead. Josh Richards wins heat three! Jason Jameson has skipped tire tech. He will be disqualified. Brandon Overton and Billy Moyer line up first in heat four. 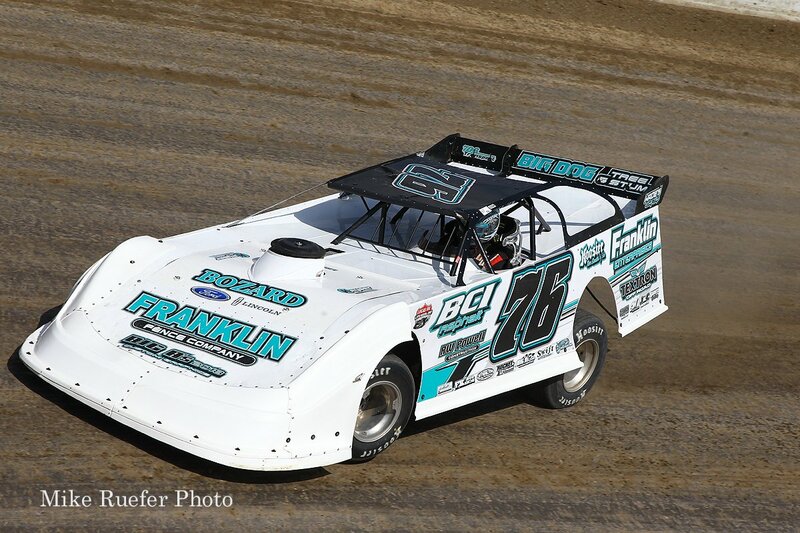 Green, Bloomquist looks to the middle. Buckingham looks to the bottom. They run four wide heading into turn one. Overton comes out with the lead off turn two. Brandon Overton takes the win in heat four. Billy Moyer and Scott Bloomquist did not go to post race tech. the top three have to go into that section. Both drivers drove by the area. Each of them then came back shortly after catching their mistake. However, each were turned away. Both drivers will be disqualified. Dustin Nobbe and Chris Madden trail the pace truck in heat race number five. Green, Nobbe leads on the bottom into turn one. Marlar slides Madden for 2nd into turn one. He’s still on the gas around the top off turn two. Marlar has a run on the leader. He swings by on the outside and takes the lead into turn three. Madden takes the lead. He drives away to take the win! Chase Junghans and Joey Coulter will lead them to the starting line. Green, Coulter spins the tires on the outside. Scott James moves to 2nd. Junghans leads off turn two. Caution, car in the wall. That’s the first caution of the entire day thus far. Green, Junghans leads by 3 car lengths into turn one. Junghans takes the win in heat six! Shane Clanton and Ryan King will lead them to the line in heat seven. Green, Ryan King is all out of sorta at the green. Clanton takes the lead. King drops through the field. Earl Pearson Jr has climbed to 2nd. He’s trying to run down the leader. He’s going to come up just short. Clanton takes the win in heat seven! Joey Moriarty and Ricky Thornton Jr lead them to the start in the final heat of the night. Moriarty spins the tires. Owens looks three wide on the bottom. Lanigan tries to find a hole between the front row starters. They narrowly head four wide into turn one. Owens never lifted, he drives it hard from the bottom to the top and leads off turn two. Jimmy Owens takes the win in the final heat race of the afternoon portion of the program! Duane Chamberlain and Josh Richards will lead them to the start in the first feature event of the weekend. It’s a 25 lap main event paying $10,000 to the winner. Green, Chamberlain spins the tires. Don O’Neal gets into the back of him before the starting line. They run four wide into turn one. Don O’Neal is looking for the lead. Richards comes out the leader. Lap 5, Richards leads Marler by 15 car lengths. Pearson is looking for 4th. he takes the spot. Chamberlain is slow on the track. The caution is out. Green, Josh Richards leads as Madden takes over 2nd from Marlar. Earl Pearson Jr catches the wall off turn two. Lap 11, Richards runs right through the middle of the track. Madden runs the bottom. He’s catching him slightly. Bobby Pierce has a flat. The caution is out. Green, Madden noses ahead through the middle. Pearson has a run on the bottom. Richards comes out with the lead. 5 to go, Richards leads Madden by 10 plus car lengths. Richards is soon to catch lap traffic. He slices through the lap cars. 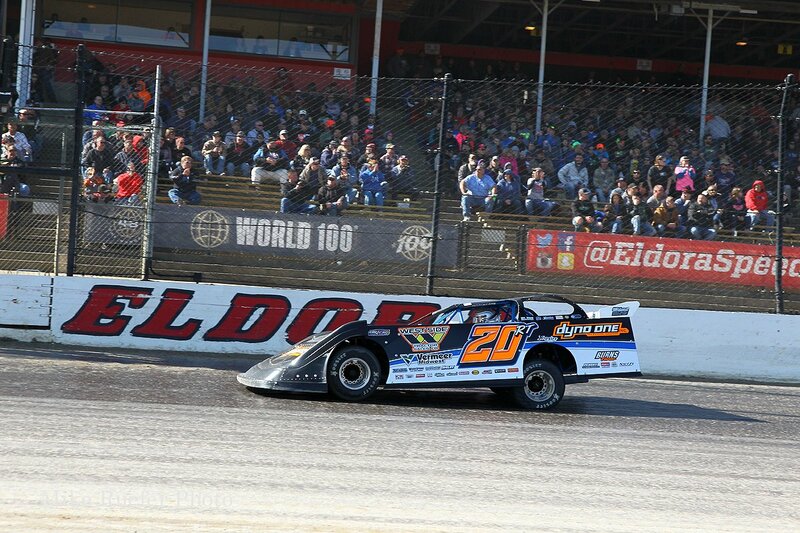 Josh Richards takes the win in the first main event of the day at Eldora Speedway! That’s his first feature win since February. 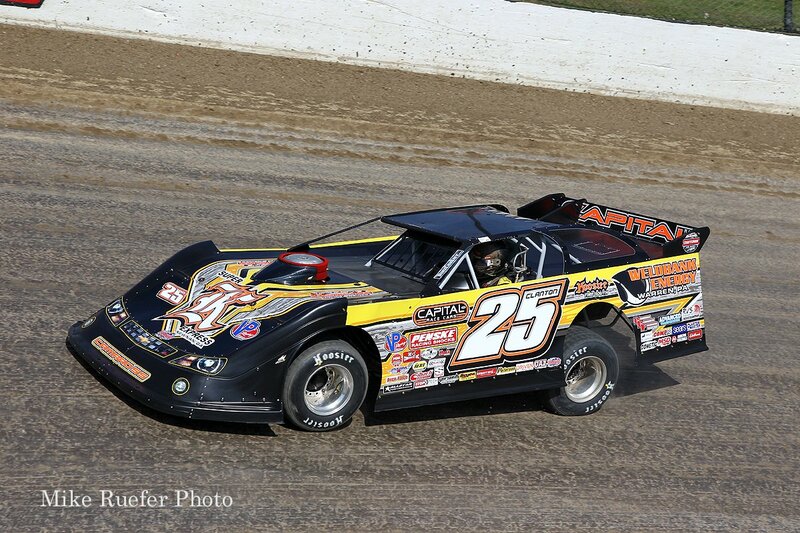 Ricky Thornton Jr and Tim McCreadie set the front row for the second on the twin 25 main events. A four wide salute for the Ohio dirt track racing crowd. Green, Thornton Jr leads at the launch. He runs all the way against the inside wall heading into turn one. He’s searching for every bit of moisture. That’s the only place it remains. Lap 6, Owens has moved to 2nd. Thornton Jr leads by a full second but Owens is coming to the front. Lap traffic ahead of the leader. Lap 11, McCreadie is running them both down. Thornton continues to struggle with the lap cars. McCreadie is on the back bumper of Owens. lap 14, Owens slips off turn two. He lifts to avoid the wall, McCreadie has a run on the bottom off turn two. McCreadie takes 2nd into turn three. The field drops to the bottom. It’s rubbered up. This race is over. 3 to go, McCreadie tries to make the outside work. He loses a spot to a lap car. 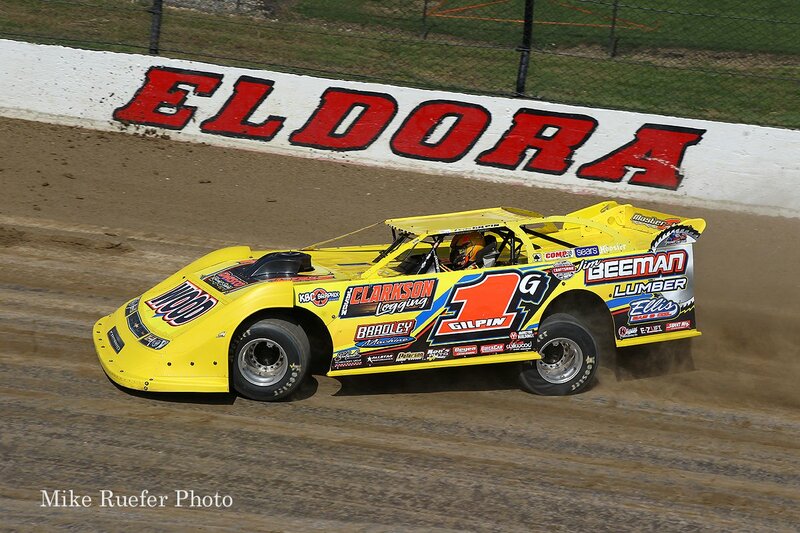 Ricky Thornton Jr takes the win in the second twin 25 at Eldora Speedway! 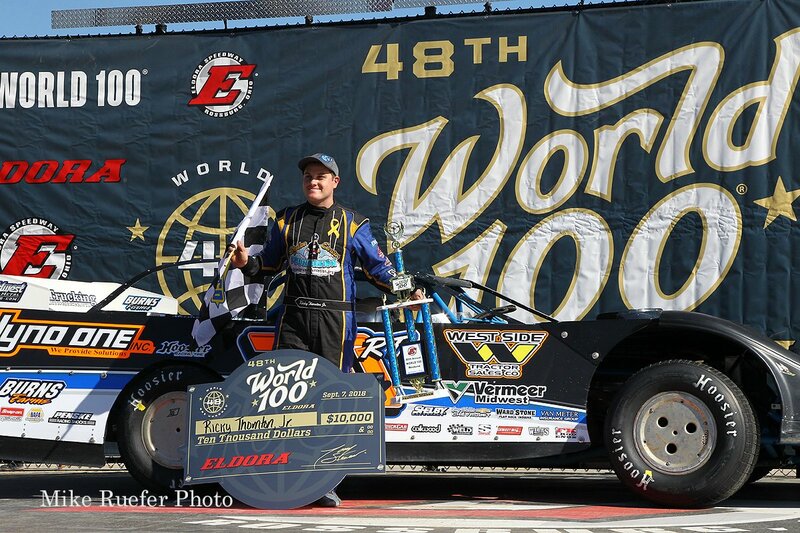 View 2018 World 100 race results from Eldora Speedway below.